Grrr! : I just created a Facebook page for "Dingbats"
I just created a Facebook page for "Dingbats"
The "Dingbats" are those usually ugly eyesore stucco box apartment buildings that are all over the West Coast and the Sunbelt. They represent to me the worst in tasteless design, bad architecture, poor urban planning and pedestrian-unfriendliness. Some of them, however, take 'bad' to a whole new level of kitschy high art. Check them out on the FB page.... Dingbat "Fan" page. "A dingbat is a type of formulaic apartment building that flourished in the Sun Belt region of the United States in the 1950s and 1960s, a vernacular variation of shoebox style "stucco boxes". Dingbats are boxy, two- or three-story apartment houses with overhangs sheltering street-front parking. The elevation view of a dingbat is "half parking structure, half dumb box." Popular in Southern California, but also found in Arizona, Florida, Hawaii, Nevada and Vancouver, dingbats are known for their downmarket status and inexpensive rents. Some replaced more distinctive but less profitable building structures, such as single-family Victorian homes. 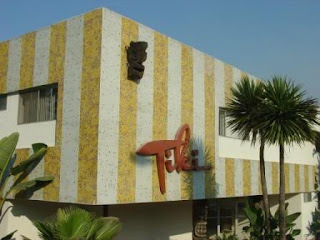 Since the 1980s they have been the subject of aesthetic interest as examples of Mid-Century modern design and kitsch, since many dingbats have themed names and specialized trim. 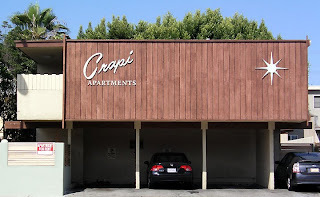 Dingbats are also reviled as socially alienating visual blights; California historian Leonard Pitt said of them, "The dingbat typifies Los Angeles apartment building architecture at its worst.""